How to tie the Surgeon's End Loop Knot. The popularity of the Surgeon’s End Loop lies in its simplicity as well as its strength. Two overhand knots with doubled line and you’re done! This creates a strong, trustworthy loop at the end of your line. This can be used to attach store bought pre-made Snell leaders (such as Eagle Claw) to your line by interlocking the two loops. To do this just insert the leader's hook through the Surgeon's End Loop and then pass the leader's hook through its own loop and pull tight. To tie the Triple Surgeon's End Loop just add another pass through the first overhand knot. This makes for a little more secure knot.The Surgeon's End Loop Knot is one of 12 great fishing knots included on the Pro-Knot Fishing Knot Cards (click to see). 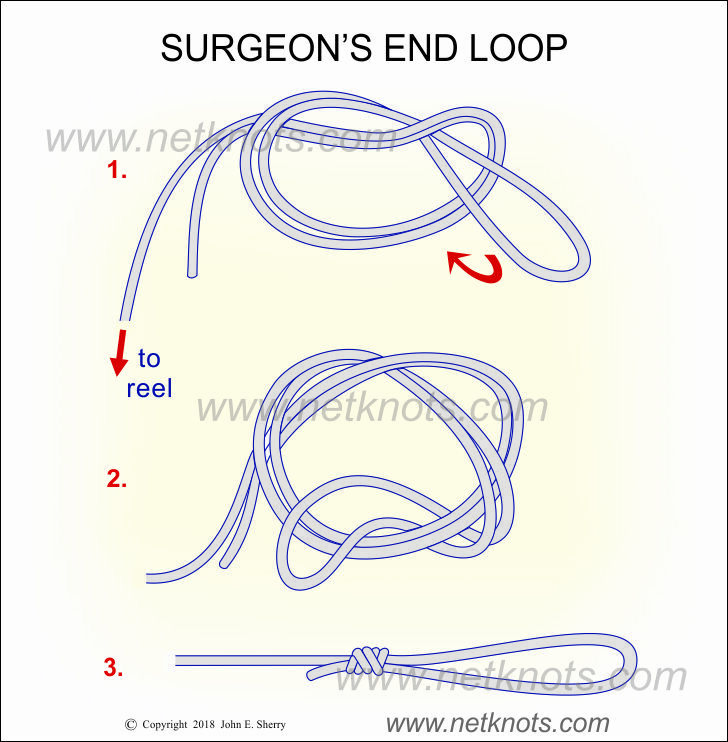 Scroll to see Animated Surgeon's End Loop Knot below the illustration and tying instructions. Double the end of the line and tie a loose overhand knot. Pass end of loop through the knot again. (Optional) For Triple Surgeon's End Loop, pass the end of the loop through the knot again. Hold the standing line and tag end and pull the loop to tighten the knot. Clip tag end close.